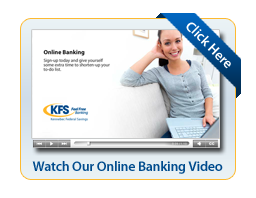 KFS Online Banking is fast, easy, and secure. Enjoy FREE 24-hour access to your accounts from any computer. Monitor your credit score with Online Banking or our Mobile banking app! Check your credit score anytime, see tips for improving your score, and get alerts when your credit score changes. You can enroll yourself instantly. It takes just a few minutes to complete the online enrollment.